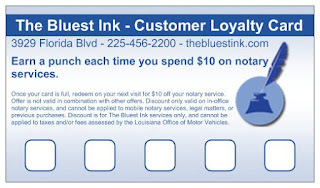 The Bluest Ink is a Notary Public and legal service provider in Baton Rouge, Louisiana. We will address our most frequently asked questions here, as well as provide general information regarding common Louisiana notary and legal issues. Visit our website at www.thebluestink.com. All materials are provided for informational purposes only and do not constitute legal advice. This site is not intended to nor does it create an attorney-client relationship. Come join our customer loyalty program! For every $50 spent on notary services, receive $10 off your next notary service! This translates into tremendous savings for all of customers, and especially those professionals who need frequent notary services. For more information, contact us at thebluestink@gmail.com or (225) 456-2200. Hope to see you soon! We are excited to announce the opening of our second location. Come see us at 10500 Coursey Blvd, Suite 107, Baton Rouge, LA 70816, inside the Court Plaza building. Same great service, now with two locations to serve you better! Come see us! For more information, contact us at info@thebluestink.com or (225) 930-8222. We are very excited to announce that The Bluest Ink Notary is now a Licensed Public Tag Agent with DMV! What does this mean for you, the customer? We can notarize your car sale, process your vehicle registration, and issue you a license plate, all in just minutes! That means one-stop-shopping for you. We'll get you in, out, and on your way in no time. Come see us! 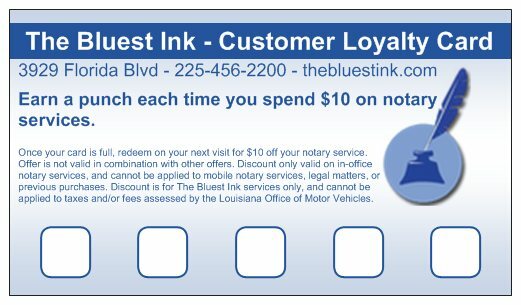 For more information, contact us at info@thebluestink.com or (225) 456-2200. If you wish to be cremated in Louisiana, you must prepare a written and notarized declaration stating as much. Otherwise, your surviving spouse or legal heirs will be designated as the authorizing agent to determine the disposition of your remains. While they may honor any verbal requests regarding your remains that you may have made to them prior to your death, they are under no legal obligation to honor such a request if it is not in writing. You can also include a cremation directive in your Last Will & Testament, provided that your Will is notarized. Once you have prepared your statement and had it notarized, it is advisable to provide a copy to the funeral home of your choosing. You can download and print a FREE Cremation Affidavit here. Once the affidavit is completed, the cost to notarize the document is $10. Should I Use An Online Divorce Service for a Louisiana Divorce? We have had quite a few clients who have retained us after having their divorce proceedings botched as a result of using an online divorce service. It's common, especially in this economy, for individuals to seek cost-cutting measures for necessary legal proceedings. However, it usually ends up costing them more in the long run to have an attorney "fix" the matter, than if they had retained an attorney in the first place. Louisiana has very unique laws regarding divorce. Legal procedures must be followed to the letter in order to successfully navigate the process and obtain a divorce. If you have already paid for online services and are having problems, we will gladly provide you with legal assistance in getting your divorce finalized. However, we think the better route is to avoid the online services altogether, and retain an attorney who can sit down with you in person and discuss your divorce, then prepare and file all the necessary paperwork on your behalf. It's not as expensive as you may think, and we offer payment plans for all of our legal services. Instead of dealing with heir finders and wondering whether or not they are legit, avoid the whole process by timely opening a succession after a loved one has passed away. Even if the deceased person leaves a Last Will and Testament, their property does not automatically pass to their heirs unless proper procedures are taken. You can avoid being targeted by heir finders if you get your affairs in order prior to your death, and leave instructions for your loved ones after you pass away. It doesn't have to be complicated, and it's not as expensive as you may think. We can help you with preparing your Louisiana Last Will and Testament, or opening a succession for a deceased relative. If anyone is injured, call 911 immediately and request medical attention. Notify the police. Make sure when the police arrive that a report is taken, and that you are given information regarding how to retrieve the report when it is ready. Get information from the scene of the accident. Try to take down the license plate number of the other driver immediately, in case he/she attempts to leave the scene. After the police have arrived, you will want the names, addresses, and phone numbers of everyone involved in the accident, including the driver of the other car, passengers, responding police officers, and witnesses. Protect your rights. Speak with an attorney before speaking with any insurance adjuster. Some adjusters may try to solicit information from you that could be detrimental to your claim. At The Bluest Ink, we provide free consultations for personal injury cases, no payment is due up front, and we don't get paid unless you get paid. We are a full service notary public in Baton Rouge, La, offering low-cost notary, legal and DMV services. Visit our website at www.thebluestink.com, and "Like" us on facebook at www.facebook.com/thebluestink.